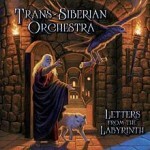 Share the post "Album review: TRANS-SIBERIAN ORCHESTRA – Letters From The Labyrinth"
Trans-Siberian Orchestra (TSO) are back with a new album and unlike previous ones this is not a one themed rock opera, instead a collection of songs with varying themes. Plus there are some classical pieces by Beethoven and Mussorgsky given the TSO treatment.The album has already been released in their native US, reaching number 7 in the Billboard albums chart and topping the Billboard rock chart. The band still feature past and present members of Savatage including Al Pitrelli, Chris Caffery, Johnny Lee Middleton, Jeff Plate and Jon Oliva. Ring Of Fire’s Vitalij Kuprij is also involved, with main man Paul O’Neill writing/co-writing all the songs, except for ‘Forget About The Blame’, which was written by Johnny Green. This song has two versions, the ‘sun’ version sung by Robin Borneman and as a bonus song, a ‘moon’ version sung by Halestorm’s Lzzy Hale. The Lzzy Hale version has of course garnered interest outside of the usual TSO fan base and is one of the album’s highlights. Jeff Scott Soto pops up on ‘Prometheus’ (about the Berlin Wall), which starts off in a classical mode before JSS comes in and with a heavy vocal – he does seem to like this heavier style he sings on the Soto albums. In fact at first listen thought it was Russell Allen, who sings on ‘Not Dead Yet’, both are top notch vocal performances as you’d expect. The musicianship and orchestration on the album are amazing as you’d expect from the TSO. The swirling strings and horns on ‘Mountain Labyrinth’ are simply astounding, whilst ‘Lullaby Night’ shows off the band’s gentler side. This entry was posted in ALBUM REVIEWS, ALBUM REVIEWS (Mobile), All Posts and tagged album, Jon Oliva, Letters from the Labyrinth, Paul O'Neill, review, Savatage, Trans Siberian Orchestra, TSO. Bookmark the permalink.